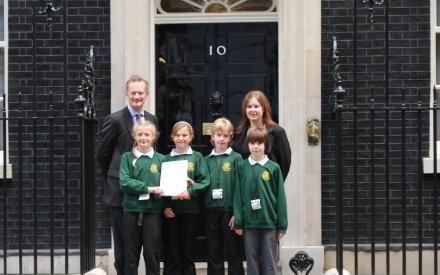 Weston-super-Mare MP John Penrose was joined by pupils from Hutton Primary School last week (Thursday, 11th June) to present his 600-name petition demanding a fairer deal for North Somerset schools to Number 10 Downing Street. The petition calls on the Government to introduce a fairer system of funding for school children’s education. School pupils in Weston and the villages are some of the worst funded in the country with North Somerset ranked 135th out of 148 local education authorities. When the school year started in September, North Somerset schools only received £3,757 per pupil, £134 less per pupil than schools in neighbouring Bath and North East Somerset, and over £600 less than in nearby Bristol. “The Government needs to end the postcode lottery education funding formula that it has set up and provide a fair deal for all children, no matter where they live. “While it was great news that there was an increase in education funding last year, North Somerset’s problems weren’t solved. Our funding started from much lower and has gone up by less than virtually everywhere else in the country. Wherever they live, all children with the same needs should have access to the same level of teachers’ attention, activities and equipment.